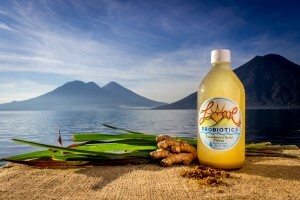 Love Probiotics’ Lemongrass Ginger Tibicos is a naturally carbonated beverage made with organic lemongrass and Guatmalan ginger. Tibicos, aka water kefir, is a “SCOBY” (a “symbiotic community of bacteria and yeast”), that is derived from the fruits of cacti in Southern Mexico. Tibicos is an excellent natural digestive aid, with many similar benefits to kombucha. One defining feature of tibicos is it’s ability to strengthens hair and nails, and improve the complexion of the skin. Tibicos is a live, unpasteurized product. Please open slowly as natural carbonation builds in the bottle. Consume promptly after purchase or refrigerate.